Carlitos Gardel Argentine Steakhouse is a family-owned and operated restaurant established in 1996. We built our reputation for the finest of authentic Argentine cuisine and hospitality at our intimate location in the Beverly Grove district of Melrose Avenue. An extensive menu of family recipes features USDA Certified Prime cuts of grass-fed Black Angus beef and sustainably sourced ingredients prepared the Argentine way. We also offer poultry, fresh seafood, and many vegetarian and gluten-free options. For 20 years our family has honored the art and tradition of Argentine hospitality by sharing the best of our culture and cuisine with the Los Angeles community. We celebrate food, wine, and people. It is the last ingredient—people—that is the most vital part of culture. It is our "razón de ser," our "motivo para celebrar." Join us. 1991: In search of a new life of opportunity, the Bozoghlian family—Carlos, Azniv, Maximiliano, Rodrigo, and Gerard—depart Buenos Aires on a one-way ticket to Los Angeles. 1996: Feeling nostalgic for home and recognizing a need for a centerpiece of authentic Argentine cuisine and hospitality in Los Angeles, the Bozoghlians open Carlitos Gardel Argentine Steakhouse as a home away from home for friends, family, Argentine ex-pats and the Los Angeles community. With Mom as the restaurant's culinary force, Carlitos Gardel begins to flourish as the family develops its connection with the community. 1997: "Papas Fritas Provenzal" (garlic fries) are introduced to the menu, becoming an immediate sensation and capturing the attention of the media and Los Angeles food sophisticates. Azniv becomes known as "Mom" to frequent patrons and new guests, expanding the menu to introduce original desserts. 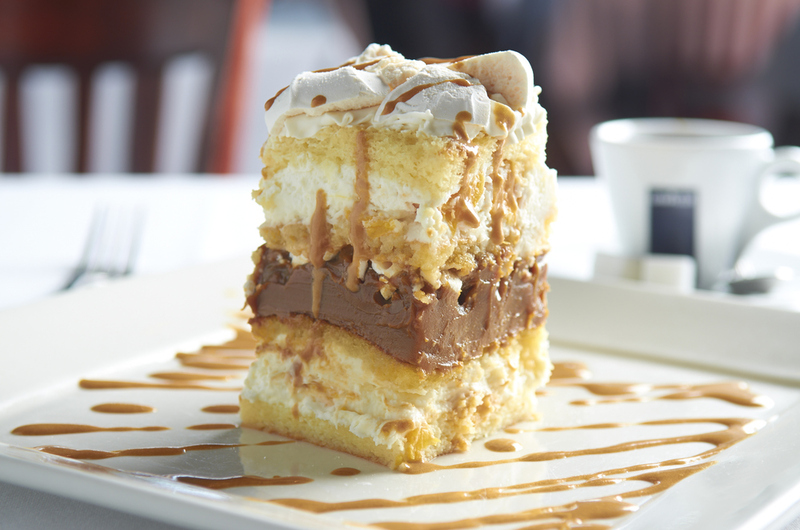 The "Postre Gardel" is born: sweetened white cake layered with peaches and cream, merengue and house-made dulce de leche. Reviews for the high quality cuts of beef, detail-oriented service, and hand-crafted pastries soon follow. Max joins the notable Bodega Weinert winery and begins an intensive education on wine, soon becoming a Certified Sommelier. Respected local food critics begin to take notice. 2004: Carlitos Gardel is recognized for its Fine Dining and secures a position in ZAGAT's dining guide and is recognized in the Los Angeles Michellin Guide. 2008: Carlitos Gardel maintains its intimate, professional service as the growing online community of reviewers takes notice. 2014: Carlitos Gardel is awarded "Best Steakhouse" and "Best Service" in Los Angeles by Citysearch and Opentable. Sommelier Max Bozoghlian (AIS and Court of Masters) directs a multiple award-winning wine program showcasing the largest cellar of Argentine wines on the West Coast with an extensive list of vintage Argentine, Italian, and French labels.